It's a common question for photographers all over - "what size do I export my image for printing?". Luckily, it has a very easy answer, and I will go over that, and more about printing in this blog post. So please, read on! More and more clients of photographers are asking/expecting the digital images from a photoshoot, instead of getting the prints made by the photographer. Which is fine if that is what you want to deliver and what your clients want. But -- do you know what you're delivering to them and what they are able to do with it? You've probably heard 'dpi' thrown around a few times, and that is what we will focus on. Before I get into too much detail about what values to use when, I'll give you the base formula and you can be on your way. And then if you want to read more, that's great, and if not - thanks for stopping by. For any print, with dimensions L x W in inches, you want to find the pixel dimensions for each, L and W which I will call Lp and Wp. I will use R to represent the 'resolution' or the recommended DPI for your print. So you take your dimension in inches for length and multiply it by your recommended dpi, and then your width and multiply it by your recommended dpi. (4inch*300dpi) x (6inch*300dpi) or 1200 x 1800. So an image with dimensions of 1200px by 1800px will be perfectly sized for printing as a 4x6 with a high amount of detail (300dpi), and it will not need any cropping when you send it to the printers. So 300 multiplied by your image length in inches is a good bit to remember for your image sizing, but sometimes even top of the line cameras will not have the sensor resolution to print an image as large as your client wants it, so if we treat 300dpi as an upper limit, we can use something near 150dpi as the lower limit which we would never want to drop below. That is the simple method to figure it out. If you want to see how dpi plays into it, and when you can use a smaller image to print a larger piece of paper, keep reading. 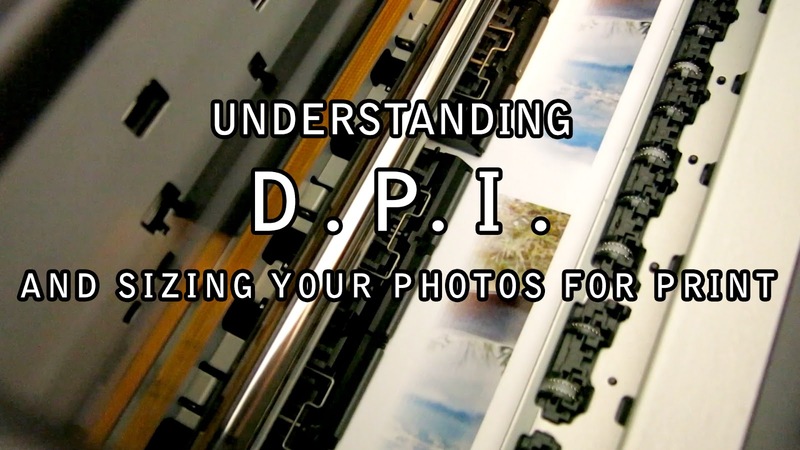 DPI simply means 'drops per inch'. Sometimes it refers to pixels on a screen when you're talking about a digital display resolution (aka ppi) , and when it comes to printing, its drops, or how many individual droplets does the printer place on the paper in a one inch line. You've probably also heard of "300dpi" if you have business or commercial clients, or graphic designers asking for images. 300dpi is kind of like a print quality standard. It's equal to about the detail your eye can resolve while holding a printed image at arm's length or slightly closer. Remember that because it's important - arm's length. Most photo printers you take your digital images to will suggest 300dpi as your resolution for an image because its going to be enough detail for most viewers of let's say a 4x6 on a fridge, or a magazine page. But how does DPI affect the viewing distance? Let's say you need an image for a billboard advertisement. I did a quick search just now for an advertising company with billboard space available, in this case, the smallest they offer is about the size of a bus stop wall, as a vertical composition at 5.9 x 3.9 ft, so because dpi uses inches, lets convert that to 70.8 x 46.8 inches. Now if you wanted to use a single photo from your camera to fill that billboard space, at a 300dpi photo resolution you'd multiply each dimension by 300 (the recommended dpi for photo printing) which leaves you with 21,240px x 14,040px and if you want to make that into a megapixel value, that means you'd need a 298 megapixel camera - unlikely. So how do they get around that? Well it's all about the viewing distance, and thats where our little 300 we used in the calculation above gets switched out. The further away your viewing distance is, the less DPI you need to use, so instead of needing a 298 megapixel image to fill a billboard, you could cut that down to something reasonable, like maybe a 17 megapixel image if you were able to go down to a 72 dpi. When you have a printed image as tall as you are, you are going to have to step back to view it anyways, if you tried to look at it at arm's length away, you'd be not only looking up and down, but you'd probably have to crouch down too, so viewing distance is probably more like 10 feet away for an entire bus stop billboard to fit into your field of view. okay.. so most of us who need to understand file dimensions as it relates to printing don't really need to worry about bus stop advertisement sizes. So let's get down to business - photo enlargements of your portraits or landscape art for a client to hang in their home. It still uses the same principles so I'll just give you some values that I like to use. Remember the 'hypotenuse' you learned in high school and maybe never expected to need in life? Well it comes in handy here. The viewing distance can be subjective, but as a general guideline, an ideal viewing distance for any image is about two times the diagonal length of the image. So in the case of a 4 by 6 again, let's calculate the hypotenuse. So 16+36=52 and then the square root of 52 is 7.211 which is the hypotenuse, aka the diagonal length of the image, then take that times two and we have a recommended viewing distance or about 14 inches. Which sounds about right when you think back to the last time you held a 4x6 to look at. It's not a full arms length. Hand a 4x6 print to a friend, ask them to look at it, and tell them to freeze, bust out the tape measure and see how close it is to their eyes. It should be pretty close to that as long as they don't have vision problems. Anyways, that is our viewing distance. Now that we have the recommended viewing distance for an image, let's see if we can reach a recommended dpi for that viewing distance, using a single figure that is related to the visual acuity of an average human's vision. Recommended DPI = 3438 / Viewing Distance. In the case of our 4x6 print we go; 3438 / 14.4 = 238 dpi. Which is almost right on the money of 240dpi - another common resolution you'll start to hear people use. If we print at 300dpi it means someone can survey an image, and then when they find something of interest within it, they can move in and get an even closer look, which would put them even closer to 300dpi. Let's put it all together now. Using a common size I get asked to print my art pieces at; a client wants a 5' x 3.5' art print for a big empty wall on a living room. As a photographer, what are the minimum pixel dimensions should I have for the photo. 5 foot = 60 inches. 3.5 foot = 42 inches. 60 squared + 42 squared = 3600 + 1764 = 5364. The square root of 5364 is 73.24. Multiply by 2, so that is about 146 inches or about 11 feet away. 3438 divided by 146 = 24 dpi. To me, that seems extremely low. I would never deliver a photo enlargement of an artistic photo at 24dpi. In fact, I've never even thought about delivering anything less than 150dpi. The main problem with this method of calculation is that it assumes you won't be moving in to look at it closer. Those pixel dimensions are smaller than what would be recommended for a 4x6 at 300dpi that we arrived at in the very start of this post. A good piece of photo art on a wall draws you in. It's great that it's big, but the subtle details are what will make a viewer move in and investigate it. So although 24dpi may be sufficient viewing resolution from 11 feet away, you wouldn't want someone to be able to actually approach the print in this case - maybe better suited to an advertisement on the opposite side of a subway platform than to a piece of art in someone's living room. (60*150) x (42*150) = 9000 x 6300 or a 56 megapixel image. Which sounds a lot more reasonable and much closer to what I would normally get printed for a client who wants a 60" x 40" print. If we run our viewing distance equation backwards with this dpi instead of 24, it tells us that our print should be able to have a reasonable amount of detail to someone who was viewing it from 2 feet away. At that distance, they wouldn't be seeing the whole thing at once - they'd be focused on the point of interested, but at least it would still have plenty of detail to engage them with. So why bother with an equation? Well there are lots of rules and guidelines when it comes to photography, and most of the time, you don't actually need to adhere to them - they just give you a decent starting point to work from, and really, that is all this is. Instead of a bunch of equations, just try to think of it like this; if you're managing the printing of a digital photo yourself, always send the largest resolution of file you can, and if you're ever in doubt, or a client ever asks what the largest print size you can make from a particular image, just use 150dpi as the lowest you'd let yourself go.